I've just come back from watching Harry Potter and the Half-Blood Prince with some friends. I organized the get-together and screening as a birthday present for one of those friends, Claire (the same Claire as previously mentioned in this old story e-mail), and wow, much better than all the previous Harry Potter movie adaptations that came before it. I give it a thumbs-up for the story-telling: where all the previous movies had a rather disjointed method of telling the story (eg: the 5th movie using those newspaper-esque montages to advance the plot, yet still relying on your prior knowledge of the book to fill-in any gaps), this one cut-out the right bits from the book such that what was left was a good enough story it's own right. I visited my doctor this morning! Yes, exclamation mark! It's been years since I last saw the family doctor - whenever I get one of those run-of-the-mill illnesses (winter cold, the flu, SARS) I tend to just let the illness run its course and cheer my body's defences on. I'm still familiar with the whole process of visiting the doctor, but with the swine flu scare gripping the country and wringing every last modicum of usefulness from the national health system, today's visit was a bit more... interesting. It started like any other early morning visit to the doctor. I entered the building to the reception and waiting area, a little surprised to see that there were many others here already. It may only be 8:35am, but it looks like things are already in full-swing. I made my way towards reception to let them know I've arrived. Me: "Hi, I'm here for my 8:30 appointment [yeah, I'm a bit late] with Dr Watson." Receptionist: "OK, I'll just add that in here..."
Receptionist: "Now, have you been experiencing any flu-like symptoms?" Well that's new. I don't remember having to answer questions like that, or any questions at all actually, when signing-in before. When I rang-up to make this appointment last week, it was about some itchiness in my joints. But in the weekend between then and now I developed a headache and sore throat. Headache's gone, but sore throat is still there. *cough cough* Flu-like symptoms? Me? It makes sense they'd ask that, being worried about swine flu and all. I better answer the lady's question. 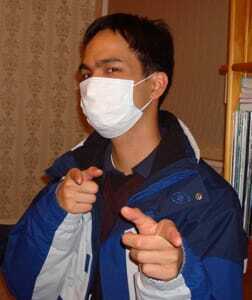 Me: "Well, I have had a sore throat recently..."
Receptionist: "OK, I'm gonna have to ask you to wear a mask then." For a sick person being condemned to wear something that would advertise my sickness - I might as well have worn a sandwich board with "Swine flu party right here!" written on it - I didn't actually mind complying. In-fact, I pulled the mask out of the box with too much enthusiasm, and then proceeded to ask the receptionist for instructions on how to properly wear the thing. Sure, I knew how it works, seeing all those pictures on the news with people wearing the masks, but I was so stoked at the idea of actually putting one of these things on and joining the millions around the world who also have them. So I took a seat in the waiting area and put the mask on, wearing it a bit too proudly - probably just as well that it covered my mouth so that nobody could see the stupid grin on my face. I looked around at the other patients in the waiting room, and found myself somewhat alone; the only other person in the room with a mask was a small boy who didn't really wear it, but had his mother put it up to his mouth when he was coughing. I turned to look at the the children's playpen which was situated next to me, only to find it devoid of all books and toys. A sign above the pen stated that: "Books and toys have been removed for the duration of the flu season." They're really taking the whole flu thing seriously. I wasn't all by my lonesome for very long. No, the next few incoming patients didn't declare any flu symptoms, but one of them turned out to be my friend and sort-of neighbour (she lives up the street from me) Clare (not the same person whose birthday it was and who I'd be watching Harry Potter with later tonight). After she told reception that she was here for her appointment, she looked around the waiting room for a place to sit, and overlooked me... twice! The damn mask has made me all but anonymous, reducing me to a member of the generic group of Sick People Who Need To Wear Masks. I pulled down the mask, said her name, and waved at her. Then she noticed me and sat down in the chair across from me. Neighbour Clare: "Hey Em. I didn't notice you with your mask on." Me: "Heh, I'm actually finding it a bit too fun! I'm expecting news cameras to show up any minute." Neighbour Clare: "Haha, yeah. I wish I had my camera here so I could take pictures of this." Me: "I already tried to do that with my cellphone, but the battery's low. And to think, I got this mask when I was just coming in for an itch!" We talked for a bit until the doctor came out to find me. I followed him into his office where I immediately noticed that he was wearing a mask too, albeit much cooler looking than mine: his looked to be made of much tougher material and had what I'm guessing is a filter (a small cylinder that jutted-out the front of the mask just a little). After seeing the doctor, I made my way to the pharmacy about a block away to get my prescription medicine. Not only did the doctor get me something for the itches (turns out it was some pretty weak eczema) but also the sore throat (tonsillitis, whoop whoop). I handed over my prescription to the pharmacist, and as I was killing time by browsing the products at the pharmacy, I came across something called "mp3 gel douche". Play your music, and become a douche, in gel form? When time came to pay for my medicine, I was expecting to have to fork over epic amounts of money for each of the meds. I was just taking out the credit card when the pharmacist said, "That'll be $9". For just 9 bucks I was able to transform my backpack into my own personal medicine cabinet, with supplies to fight bacterial infections and skin irritation for a month! Just like when I bought a McDonalds Apple Pie to discover they had cut the price of it in half, the $9 price tag for all this medicine made me feel like I had just won something. And to top it all off, I managed to get away with a souvenir: when I was paying for the visit to the doctor, I asked the receptionist if I could keep the mask.